After making your decision to have breast augmentation, one of the most important steps that comes next is determining the size, shape, and type of implant that will best meet your needs and goals. Dr. David Mosier and Dr. Steven Holzman offer a variety of breast implant options at our Austin, Texas practice. One of our plastic surgeons will meet with you in an initial consultation and explain all aspects of breast augmentation to you, answer your questions, and go over the many varieties of breast implants to help you decide what’s best for you. Contact the Plastic Surgery Center of Austin to for more information on breast implant options. There are two basic types of breast implants: saline and silicone. Both are approved by the U.S. Food and Drug Administration and both have proven effective at bringing patients successful breast augmentation results. We use two of the most popular brands of breast implants in the nation, Natrelle® from Allergan and Mentor breast implants. The types of breast implants available at our practice come in hundreds of sizes and shapes, offering you a range of choices for your needs and goals. Saline breast implants are the most common type used in breast enlargement surgery. They are composed of a silicone outer shell, and are filled with a sterile salt-water solution. Saline breast implants are not pre-filled before insertion – they are empty once placed into the breast pocket and then filled later during the procedure. This is advantageous in that the incision made for placement is often smaller for saline breast implants, which typically results in less scarring. One disadvantage of saline implants is they can cause the appearance of rippling under the breast in some cases. Some patients have also experienced capsular contracture, a condition characterized by scar tissue forming around the implant and giving the area a hardened feel. In 2006, the FDA approved silicone breast implants for use in breast augmentation procedures for patients over the age of 22. Silicone implants are made of a silicone outer shell containing a silicone gel. 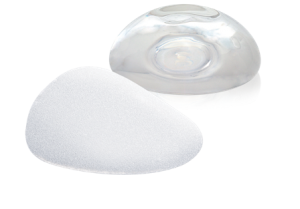 This type of breast implant can often feel more natural than its saline counterpart, and there are less instances of rippling with silicone implants. However, silicone implants typically require a larger incision for placement. Also, if the implant ruptures, it is less noticeable and less easily absorbed by the body than with saline implants. Patients who have silicone breast implants should have their breasts checked regularly to make sure they are functioning properly, and should not hesitate to call their doctor if they feel something may be wrong with the implant. In most cases, there are usually sizes and shapes of breast implants that will almost seamlessly match the diameter of your breasts. They come in round and teardrop shapes, and the size will ultimately depend on your breast augmentation goals. A good way to achieve a look that appears natural and beautiful is choosing a size of implant that adds volume to the bustline while looking proportionate to the rest of your body. Our plastic surgeon will show you a variety of implant types, sizes, and shapes to help you get an idea of your options. Please contact Plastic Surgery Center of Austin to schedule a consultation. We will be happy to go over the many breast implant options available at our practice.